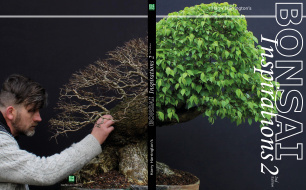 The subject of this Progression Series started its life as a bonsai in fairly unfortunate circumstances. I had initially discovered it growing alongside a dirt track during the Winter of 2001-2002. I decided against collecting it immediately but chopped the trunk back hard to encourage more low-growing shoots, with a view to collecting it during the Spring of 2003. Sometimes it is simpler to work on a tree while it is still in the ground rather than taking it home immediately and having to find room for it in the garden! August 2002: You can normally guarantee that a tree that has grown undisturbed in the ground for 20-30 years will continue to do so in the year after you start working on it. Unfortunately while walking around my collecting-grounds the following August, I discovered that the tree had been run over by a car driving along the dirt track and had been completely uprooted. As can be seen in the image above, the leaves had already collapsed and browned off, a sure sign that a tree is drying out and very likely to die unless immediate action is taken. What possessed me to even bother picking up what was left of the tree I don't know, it was a mess! As can be seen in the images above, there were very very few roots left! The tree had been lying on it's side with what remained of its root system exposed to the air for at least 2-3 days. Fortunately it had come to rest covered in wet grass and this had stopped the roots from drying excessively. August in my part of the UK can have periods of very warm, wet and humid weather and this had also helped stop the wood from drying out too much; a few weeks earlier and the tree would have rapidly dried out and died in the hot July sun. In the images above you can see that I removed all damaged roots and limbs and then carefully tidied up all of the wounds with a sharp knife (torn and ripped wood is more difficult for the tree to seal requiring greater resources and further weakening the tree). All of the wounds were treated with a thin smear of petroleum jelly only. The tree was planted up into pure sphagnum moss and the tree and its pot were left soaking in a shallow tray of water. The purpose of placing the tree and its pot into water was to ensure that the remaining wood could not dry out and to almost 'force' water to enter the tree by thoroughly soaking the base. Co-incidentally, I didn't bother to use any magic potions of the Superthrive variety. October 2002: By early-September, new buds and embryonic leaves had started to appear. These will have been produced by the tree purely from stored resources within the trunk and branches. By mid-October those new buds had produced 5 or 6 strong shoots that indicated that the tree would almost certainly have produced new roots from what was left of its old root system. By this time the tree had been placed on a bench; while the water was useful during the initial recovery process, once it became evident that the tree was growing new roots, it was important that they were not left submerged in water for too long. While I was pleased that the tree was very likely to survive, what remained of the tree (see images above) wasn't actually that good for bonsai! While the trunk had some decent mature bark and some nice movement, it was too tall (for its girth) and lacked any usable low branches to chop the trunk to. I kept the tree protected from the worst of the cold throughout the following Winter by placing the pot on a heated growing bed and then in the late Spring of 2003, when the tree had leafed out again and it was obviously strong enough, I planted it out into my growing field. As there was nothing that particularly excited me about the state of the tree and I had also noticed that the new roots had grown from only one-side of the trunk base, I (fortuitously) decided to plant the trunk at an angle to the ground so that the trunk looked as though it had fallen over. The tree was placed on top of a buried tile in the ground to keep the roots growing laterally and to stop any deep-growing tap-roots and it was then left to grow for three years. March 2006: 3 years later and the Hawthorn had fully recovered its vigour, having produced plenty of very strong vertical shoots. During the previous years the tree had simply been fed with an annual slow release fertiliser and pruned back each Winter, otherwise it was left to its own devices.